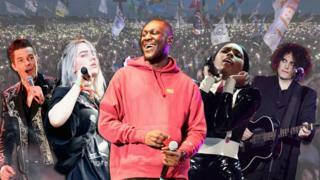 Although the three Pyramid Stage headliners are all male, 42% of the currently-announced line-up is female, highlighting the festival's commitment to gender parity. "The gender balance is something I consider at every stage of the booking process," said festival organiser Emily Eavis in an interview last month. "We're a little way off being 50/50 across the whole festival, but in 2017 the Park Stage was 50/50 and that will be the case on other stages this year. We're definitely moving in the right direction." The Cure's headline performance is their first since 1995 and their fourth overall, meaning they tie with Coldplay as the festival's most-frequent headliners. The Killers previously topped the bill in 2007; while Kylie was booked for the top slot in 2005, before breast cancer forced her to pull out. "It will be 14 years since I was originally meant to appear there and so much has happened up to now," said the singer, as she announced her return last December. "I can't wait to see you all there to share this special show." Eavis recently confirmed that The Prodigy had been booked to play prior to frontman Keith Flint's tragic death last week.